One of the older stadiums in Triple A baseball, Greer Stadium opened in 1978. The stadium gave Nashville a professional baseball team. 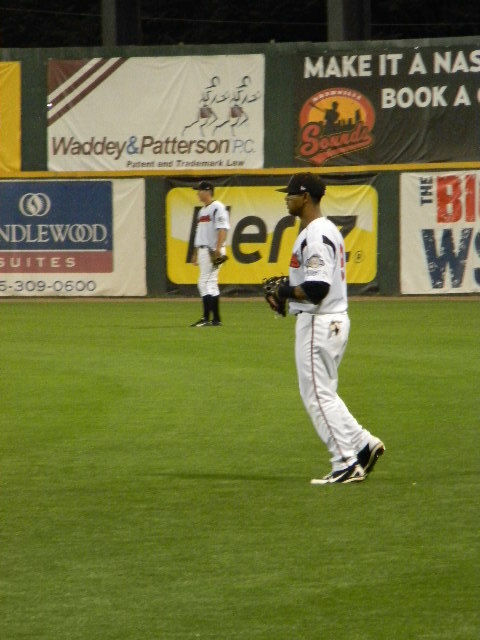 The Sounds are currently a minor league affiliate for the Milwaukee Brewers. Reserved seating can be found from the first baseline to the third baseline. These seats are sections A-V and HH-SS. Sections HH-SS are separated from sections A-V by a common walkway used by both seating areas. The seats in the stadium are chairbacks and blue. Down the first baseline in the top corner there's general admission seating. These sections of seating are bleachers. There isn't permanent outfield seating outside of the decks, but plenty of standing room spaces right on the outfield wall. The outfield walls feature plenty of advertising. There are several other areas in the ballpark to watch the game. Down the left field line you have the Delta Dental Deck. 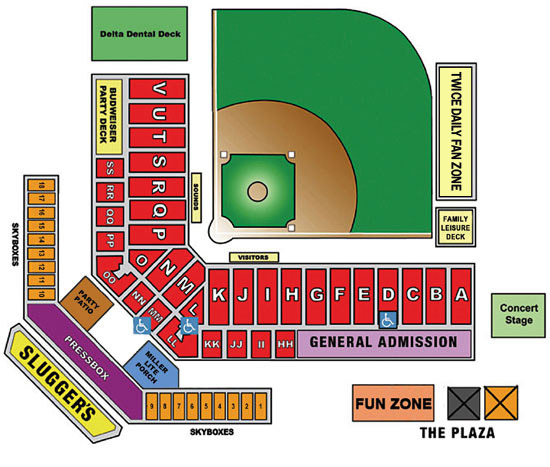 In right field you have both the Twice Daily Fan Zone and the Family Leisure Deck. They have two patios located in the main seating area behind home plate the Miller Lite Porch and Party Patio. Greer Stadium has one restaurant, Slugger's Sports Bar & Grill. It's located on the 4th floor of Greer Stadium. It's opened on game days one hour prior to the game. The restaurant has 11 TV's and radio broadcast of the Sounds game. Greer Stadium has 18 suites that are centrally located behind home plate. Greer Stadium has one entrance which drops you on to the lone concourse. The concourse features the Pro Shop, Kids Fun Zone, concert stage. You can find several dining options on the concourse. Your traditional ballpark food like hot dogs, nachos, and popcorn. You can also find the Yazoo Brew Pub stand, Ozzie's Ice Cream Shop, and Whitt's Barbecue. 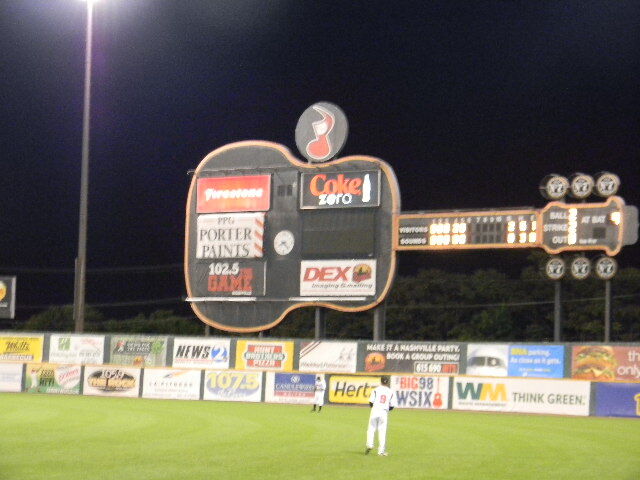 The lone scoreboard sits in the shape of a guitar in left field and stands 53 feet tall. The line score is located on the neck. The guitar's body has several advertisements and a video board (wasn't working on my visit). The turning key section has the count, player's number, Hit/Error. The home and away bullpens are located on the field down the 1st and 3rd baselines. Greer Stadium has plenty of parking near the stadium. Two parking lots are located off of Chestnut Street. #1 Head downtown to Broadway. This is Nashville's famed street filled with live music and plenty of food. #2 Take a walk down one of the most famed country music areas in the world, Music Row. 16th and 17th street are good streets to start exploring on. #3 If you are interested in walking campuses, two great ones lay within a mile of each other, Belmont and Vanderbilt. If you have the time, check these universities out. #4 If you are looking for a place to eat before the game, try Hattie B's. Nashville is famous for its hot chicken and Hattie B's is a local favorite. #5 Head to Greer Stadium! Greer Stadium: I will start by saying I know the Sounds want a new stadium. I expect more out of a Triple A stadium and a stadium located in a large city. The scoreboard is cool, but outside of the shape of the guitar, what does it bring do the fans? The seats are OK, some of them have faded to a different color, no cup holders are a negative. The stadium does have some decks and patios, which is nice for fans. I will say this, when I was standing out beyond the outfield wall, the stadium grew on me. Standing on the outfield wall is the best place to watch the game in the stadium. You can literally stand right on the wall. The concourse kept a nice sounds themes throughout, but when you reach the seating area you loose that feel with the blue seats. The Sounds do need a new home. If the current stadium was in a better location, I'd say do major renovations, but it's not. Scoreboard: I love the idea of a guitar shaped scoreboard. Unfortunately the scoreboard is outdated, tons of advertising, and the video board isn't working. When they move away from Greer, I hope they keep the guitar scoreboard concept. Atmosphere: Pretty good crowd on hand. They held a concert before the game and a concert after. The crowd was pretty active throughout the night. The in game entertainment was OK.
Nashville: The area around the stadium is the most buzzing portion of town. A few places to check out on your visit are Music Row, Broadway, and Belmont/Vanderbilt. 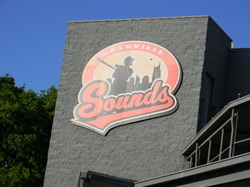 Music Row is the home to country music. Plenty of recording studios, restaurants, and bars can be found here. Broadway is famed for its live music you can stop into most restaurants and hear perhaps the next big star. Bridgestone Arena is located on Broadway which includes the Tennessee Sports Hall of Fame. The Country Music Hall of Fame sits just blocks away. The Belmont/Vanderbilt area hosts some of Nashville's best dining options as well as two great campuses to walk. Centennial Park is nearby and it is the home to the Parthenon. The Parthenon is an art gallery and a full scale replica of the Parthenon in Greece. 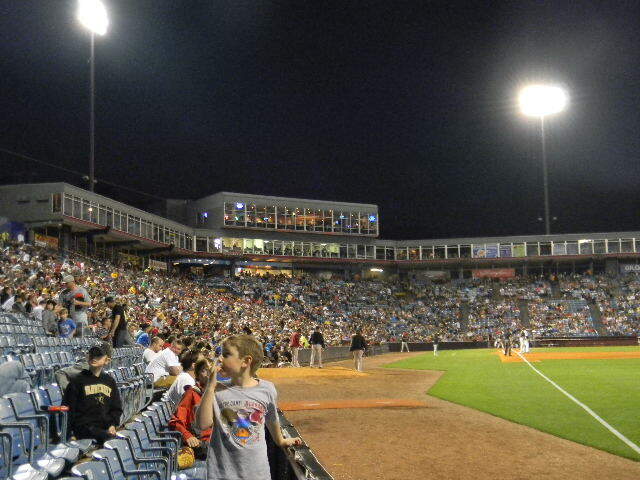 Whats your rating for Greer Stadium?